GoT fans, here's all the insider deets & pics from Jon Snow's Scottish Wedding! Ladies, keep your tissue box ready as Jon Snow is officially taken forever now! “All hail” to the new king and queen of the throne. 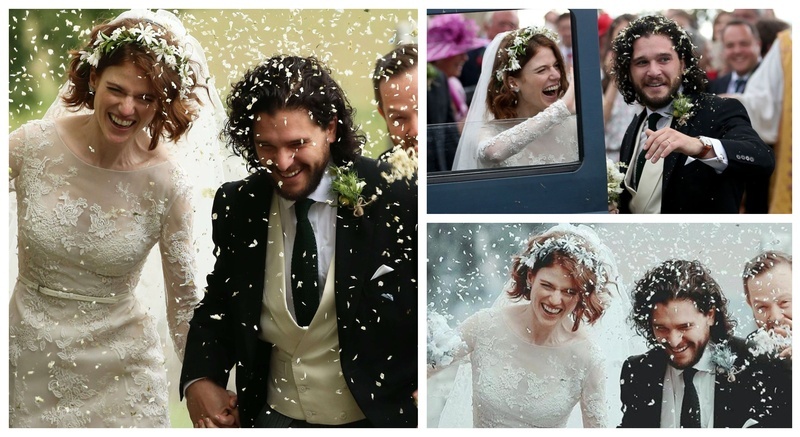 Jon Snow aka Kit Harington, the ‘Rightful King of the Seven Kingdoms’, and Ygritte aka Rose Leslie, an actual queen, got married in a beautiful wedding ceremony in Aberdeenshire, Scotland. The wedding took place in a real-life castle owned by her family! The bride walked down the aisle in a flawless off-white Elie Saab floor-length gown. It featured sheer long sleeves, lace overlay, a belted waist, and a dramatic skirt all in absolute perfection. She completed her bridal look with a floral headpiece, a veil, minimal makeup and an infectious smile. She was accompanied by her father who wore a traditional Scottish kilt. As for the groom, turns out Kit Harington CAN smile :P! He looked his dapper self dressed in a cream-colored vest and striped pants. Is it a coincidence that the flower petals look like snow? I think not! They were doused in flower petals on the way out of the venue, which clung like snowflakes onto Harington's signature curly locks. As for the star-studded guest-list, it almost felt like a family reunion for the "Game of Thrones" actors. The Stark sisters - Sophie Turner and Maisie Williams, looked as fierce as their on-screen characters and arrived together. Mophie, as they are affectionately called, rocked red and black together with contrasting printed bags. Totally adore Turner's monogrammed Louis Vuitton checkered crossbody. Then there was Khaleesi - Emilia Clarke. The Mother of Millennial Pink arrived, wearing a botanical printed dress with a matching duster. Love the pop of green on his tux. Sources say, the reception, where many of their "Game of Thrones" co-stars were seen, was held inside Wardhill Castle. Our hearts are so full of love for these two! Congratulations to the happiest couple in the North!